My wife has been complaining for several weeks now, that it’s too warm here in Rochester. “There’s no snow”, she complains, Telling me repeatedly that she likes winter she likes the snow and so on. She’s been getting our wish the last couple of days, current temperature outside in Rochester is 14°, it’s supposed to be getting no higher than 26 tomorrow. At the moment we have perhaps 2in. of snow on the ground. January 22, 2007) â€” MENDON â€” See Spencer Green. See Spencer go fast. Really fast. The Honeoye Falls boy squealed with excitement as he, his young cousin and his dad â€” all crowded onto an inflatable sled â€” quickly started picking up speed down a slope of hard-packed snow in Mendon Ponds Park. Spencer, 8, likes sledding. A lot. I don’t profess to do crowd estimates, There were seven events venues at Mendon yesterday,.and all the parking lots were filled. 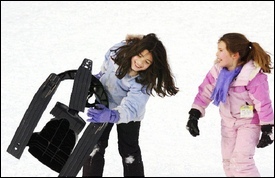 Then the major event was not the Winterfest but rather the sledding hills. ?